Katie Serbinski, M.S., R.D., is a registered dietitian and millennial mom, blogging about healthy recipes, child and mom nutrition, and motherhood. I hope you guys aren’t missing me too much… because I’m loving all these recipes and tips from my gal pals while I’m on “blog maternity leave” [it’s a thing]! And today’s recipe is definitely making my meal rotation for one BIG reason: the SLOW COOKER! Enjoy! Hi there readers of Mom to Mom Nutrition! I am Kristen over at A Mind “Full” Mom, where I share real food for real families on real budgets. I am so excited to be guest posting here today as Katie is taking a bit of time off to enjoy her sweet baby girl. The recipe I’ll be sharing is as unique as it sounds—> slow cooker Mexican BBQ chicken sandwiches! As I stated, I share food for REAL families on REAL budgets. So forget those fancy, schmancy place settings and gourmet meals you see on Pinterest–I, like you, don’t have time for that!! Nor do my children appreciate fussy meals. While I strive to serve my family a home-cooked meal every night, it is NEVER on china and rarely does it take more than 30 minutes. And I am the master at creating things from little or what I have in my pantry–because I, like you, don’t have unlimited funds at the grocery store. And even more true is that I don’t have time to run to the store for forgotten ingredients! Enter my hero, the SLOW COOKER!!! Seriously, it is almost magical. You place a bunch of things into it, go about your crazy day and dinner is made for you!!! It may just be the most used appliance in my kitchen. Especially in the summer. I live in North Carolina and we get hot here–too hot for me to crank the oven on. One of my favorite things to make in the summer is pulled meat for sandwiches or tacos. We love BBQ Pulled Pork sandwiches. And the leftovers make a great BBQ Pizza. We also love Pork Carnitas with Mexican Slaw. Both recipes make a ton. So either we eat on the leftovers for lunches or I freeze half for another busy day. Today I want to share with you one of my all time favorite recipes that is SO easy: Slow Cooker Mexican BBQ Chicken Sandwiches. As I mentioned before, 3 unlikely ingredients come together to create one out of this world flavor combo: salsa, BBQ sauce and chicken. How easy is that? I love piling a soft bun high with this meat and then topping with a homemade slaw for added crunch and freshness. However, the slaw can be omitted (my kids eat it on the side). This meat would also be fabulous on a taco salad, in a quesadilla, as a topping for a baked potato–you get the idea. Place all ingredients in your slow cooker. Cook on low for 6 hours or high for 3 hours. Shred with 2 forks. Serve on buns with coleslaw if desired. Bottom line is that this meal is easy, versatile and a family winner! I hope your family will enjoy these Slow Cooker Mexican BBQ Chicken Sandwiches as much as my family does. 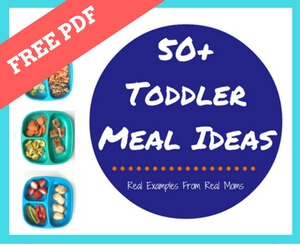 I encourage you to hop on over to A Mind Full Mom to check out more delicious easy meals to keep your family full. Subscribe to get email updates and my FREE Slow Cooking 101 printable. Use my basic formula to build healthy fix-it and forget-it meals the whole family will love! I share special behind-the-scenes snapshots from our life, plus Mom to Mom tips, nutritional advice and much more. Plus, be the first to find out about upcoming events, new products and much more. I follow your site every day. Hi, I’m Katie! Registered Dietitian, Mom, and Mealtime Negotiator. I’m on a mission to make mealtime happier, healthier, and easier with small children, despite what my 3 toddlers have me believing. From family-friendly recipes to confessions about carry-out, I hope you grab a seat at my kitchen table!